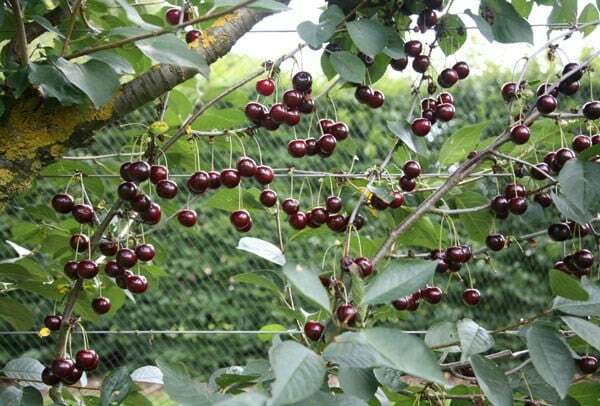 Buy cherry 'Sunburst' cherry Sunburst: White blossom and juicy near-black cherries. This plant is deciduous so it will lose all its leaves in autumn, then fresh new foliage appears again each spring. A vigorous tree, which is upright at first but later spreading as it matures. The white flowers appear in mid-spring and these are followed by very large, near-black cherries (darker than Stella) from mid July. 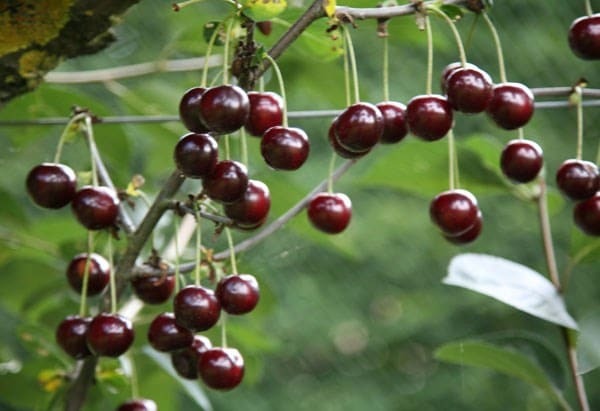 It is a popular, self-fertile, sweet cherry - and the large fruit have a gorgeous flavour. The plants we sell in a 10lt pot are around 1.2 - 1.5m tall and 2 years old at the moment and will usually start to produce fruit in their third or fourth year. Garden care: When planting incorporate lots of well-rotted garden compost in the planting hole and stake firmly. Stone fruits like the cherry should be lightly pruned in the summer because they are prone to a disease called Silver Leaf which enters through cuts. If you prune in late summer, the sap is slowing but is still running fast enoughenough to seal up any wounds. Lighlty prune to retain shape and remove any damaged, diseased or broken branches. Hi. I am wanting to plant a line of 3 fruit trees at the bottom of my garden (including a couple of cherry trees e.g. a sunburst - Gisela 5). Can you please tell me what is the closest distance they can be planted apart. I realise that ideally they should be spaced at a distance equal to the height/spread of the tree - in the case of the sunburst 3m apart but was wondering what would happen if they were planted closer together. I thought they might adjust accordingly and grow to the available space with pruning etc - or is that just wishful thinking?! Many thanks. Hello there This cherry is grown on a Gisela 5 rootstock as a bush form, so it won't be a large spreading tree. The minimum I would plant them apart would be 2m. You can prune to control the size, but this needs to be done in the summer. What are the best times of the year to plant 0ut cherry trees (1)Stella (2)Sunburst. I live in Cardiff South Wales surrounded by a predominantly clay soil. Hello there The ideal time to plants a fruiting cherry is between November to March but you would still be ok now. We still have cherry 'Stella' available in a Colt bareroot (bush) http://www.crocus.co.uk/plants/_/cherry-stella/classid.814/ and a cherry 'Meteor Korai' http://www.crocus.co.uk/plants/_/cherry-meteor-korai/classid.2000022474/ Hope this helps. Hi, I'm thinking of buying your cherry 'Sunburst' but we will be moving in a year or two. Will it be OK to replant it then, or can I keep it in a pot until then?